The primary objective of the study is to estimate the energy absorption (EA) capacity, brittleness index (ductility) and stiffness characteristics of Sand-Tire Crumb Mixtures (STCM) using direct shear test and Unconsolidated Undrained (UU) triaxial test for the effective reuse of waste tire crumbs as isolation materials. The properties considered include, strength and deformation characteristics of a STCM. A relatively uniform sand and readily available tire crumb grouped into four size has been selected to generate STCM. Experimental studies have been carried out on STCM with constant density of 1.54 g/cc. Stress-strain curve obtained from UU test has been used to estimate EA. The experimental results show that peak strength, EA and stiffness increases with increasing percentage of tire crumbs up to 25% and starts decreasing thereafter. Among the tested tire crumb sizes, crumb size IV provide the maximum EA without compromising on strength compared to other tire crumb sizes. Urban agglomeration and population growth results in increasing automobile industries and in turn increase the disposal of waste products from these industries, including scrap tires (WRAP, 2007; RMA, 2009; RRI, 2009). Most of the wastes generated from automobile industries are reusable without affecting surrounding environment except vehicle tires. On an average, scrap tires are generated one per capita annually in many of the countries (Edil & Bosscher, 1994), particularly in developing countries facing significant disposal problem. It is estimated that, 13.5 million tons of tires (United States 4.4 million tons) are scrapped each year (Genan, 2012). In Canada, it is about 28 million scrap tires (Dickson et al., 2001), and in Europe, approximately 5.5 million tons (ETRMA, 2010) are stockpiled. In Korea, approximately 20 million tires are removed every year (Yoon et al., 2008). In India, it is estimated that at the end of 2010, 112 million tires are scrapped (Rao & Dutta, 2006). These tires cannot be deposited in landfills as they occupy large space, gives an ugly view and forms ideal breeding places for mosquitoes and other insects (Masad et al., 1996). It becomes harder and also expensive to dispose them safely without any threat to human health and the environment in many regions of the world due to the possibility of fire and health hazards. This situation has produced a need to find new beneficial ways of recycling waste tires. Current beneficial way of recycling waste tires, includes tire-derived fuel for energy generation, tire retreading applications, highway crash barriers, breakwaters, reefs and crumb rubber asphalt pavement (Lee et al., 1999). These reuse and recovery effort has reduced the amount of landfills by consuming 89% of waste tires in the United States (RMA, 2009), and around 90% in European Countries (ETRMA, 2010). But, some of the current uses of recycling waste tires has negative impact on environment. Though current reuse and recovery effort has slightly reduced the amount of landfills, but still there is a need for developing additional practice for the reuse of scrap tires. One of the applications is to reuse tire in civil engineering as an alternate material in construction projects. Over the last few years, recycling of waste materials as construction materials has been considered important to improve geotechnical properties of soil and to solve economical and technical problems for a sustainable environment. 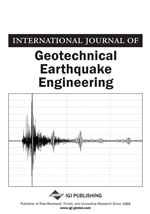 Geomaterials derived from scrap tire are used in several geotechnical applications and related papers can be found in Hazarika & Yasuhara (2008). Tire crumbs were widely used as light weight materials for backfill in embankment construction due to a shortage of natural resources and increase in waste disposal cost (Edincliler et al., 2010). Significant reduction in loss of lives due to earthquake can be achieved by implementing safe seismic construction procedures. But the existing safe seismic methods need an extra 15-25% cost of the project, which cannot be afforded by the common man in the developing countries. A developing country is one where the buildings are predominantly non-engineered and building codes are not implemented effectively (Charleson & Fyfe, 2001). Many earthquakes that have occurred in the recent past have shown high potential of loss of lives and property under moderate to high level of shaking. The risk to life is further increased due to increase in the population density in cities in developing countries. This led to finding new beneficial ways of increasing safety of the house of the common man without increasing cost of construction in the developing countries. Any innovative system can be widely adopted in developing countries, if it is a cost effective technology (Tsang, 2008; Tsang et al., 2012).